A unique individual yet connected and part of the Whole. 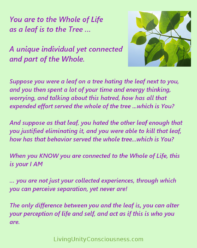 Suppose you were a leaf on a tree hating the leaf next to you, and you then spent a lot of your time and energy thinking, worrying, and talking about this hatred, how has all that expended effort served the whole of the tree …which is You? 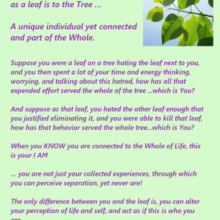 And suppose as that leaf, you hated the other leaf enough that you justified eliminating it, and you were able to kill that leaf, how has that behavior served the whole tree…which is You? … not just your collected experiences, through which you can perceive separation, yet never are! The only difference between you and the leaf is, you can alter your perception of life and self, and act as if this is who you are.